The phenomenon of simultaneous vision with two eyes, producing a visual experience of the third dimension, that is, a vivid perception of the relative distances of objects in space. In this experience the observer seems to see the space between the objects located at different distances from the eyes. The phenomenon of simultaneous vision with two eyes in which there is a vivid perception of the distances of objects from the viewer; it is present because the two eyes view objects in space from two points, so that the retinal image patterns of the same object are slightly different in the two eyes. Also known as stereopsis; stereoscopic vision. 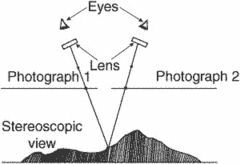 The art and science that deals with the use of binocular vision for the observation of a pair of overlapping photographs or other perspective views. It also deals with the methods by which viewing is produced. They can then download and watch the Stereo 3D excerpts on their mobile devices, featuring spectacular nature footage. Featuring a fresh projector design with an improved lens mount, the RLM-W14 also offers Active Stereo 3D, extended warping and blending, and comes with video over a single Cat 5 cable functionalities (HDBaseTTM) as standard. Then there's Ocula, an add-in that Foundry wrote as the stereo 3D market was emerging in 2008. With the latest K2 software release including ChannelFlex, the K2 Summit can be feeding stereo 3D clips during one production and handling super slow-motion replays on the next. iPONT USA will demonstrate a 3D TV Box, which converts any stereo 3D source, including 'live' 3D broadcasts, in real-time for viewing on a 3D without glasses screen. Bernard Mendiburu, VP Professional Markets, Volfoni Group: “I am extremely proud to introduce these Stereo 3D Gaze Tracking Glasses with the world leaders SMI and ART. This technology partnership provides industry-leading stereo 3D support in an all-in-one solution that enables control over each aspect of the 3D experience - the DLP projector, 3D software, and graphics card - from a single software control panel. Reliance MediaWorks, a subsid of ADAG, last week partnered with post-production and vfx studio Digital Domain in a deal that will set up visual effects and stereo 3D production services studios in Mumbai and London and make it possible to work on film projects round-the-clock. Mr Naveen Gupta, Executive Director, Frameboxx said that a major chunk of Hollywood work for conversion of movies into stereo 3D conversion is being outsourced to India in a big way and one of the leading Indian studio, Prime Focus, has recently bagged an order of US$ 2 billion, and there is a huge demand for trained manpower to handle the work. AJA recently collaborated with workflow solution developer CineForm to provide Apple and Windows-based NLE and effects software users with a variety of ways to output stereoscopic 3D material using the AJA Kona 3 video capture card through CineForm's Neo3D software, which will enable Kona 3 to support multi-platform stereo 3D output. is a pioneer in stereo 3D content delivery and auto-stereoscopic display technologies. The software accelerates and increases the quality of professional semiautomatic stereo 3D conversion performed by film post-production companies, VFX companies and 3DTV studios.